Karen Fredrickson and MRR Pyro (Murphy) attired in black beta Deluxe Add-On headstall/halter combination and Style D breastplate, both with stainless steel Horse Shoe Brand hardware and German martingale and reins. This team won the Pard'ners Award in 2011 and attained the Perfect 10 award. Murphy was also awarded AERC Hall of Fame Horse in 2015. The German martingale and reins are very strong, will not stretch and the hardware will not rust. And like all biothane and beta tack, require no upkeep other than soap and water to clean. German martingales and reins, in beta and solid brass or stainless steel hardware, are available in closed reins or split reins. 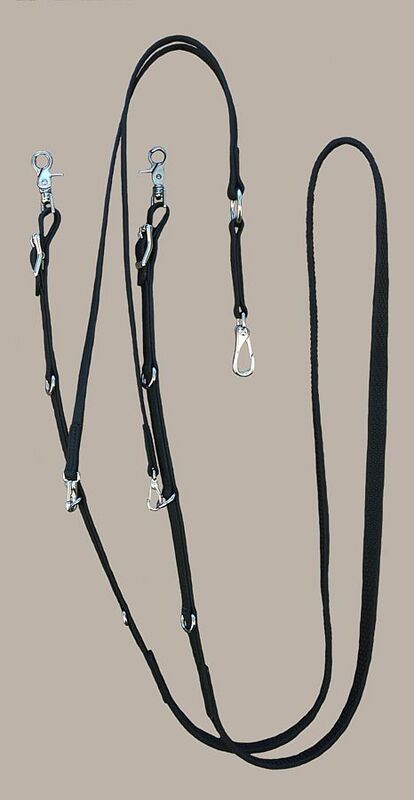 Closed reins come in 9 ft. or 10 ft. Split reins come standard at 7 1/2 ft. Center bar buckles are sewn in at the bit end for convenience and versatility. Options available, such as rein grip in hand area and/or martingale around neck (See photo). Please call for custom reins. GM/GpK - $160.00 - closed rein with rein grip in hand area. - brass hardware. GM/GpKss - $175.00 - closed rein with rein grip in hand area. - stainless steel hardware. Rein grip is available in black and chestnut brown. Pictured with stainless steel hardware. Pictured in violet beta/black beta with stainless steel hardware. This ss snap is small yet strong, so it is the best option for the German Martingale. It is also used either face up or face down. German Martingale with black rein grip in hand area pictured in ss hardware. 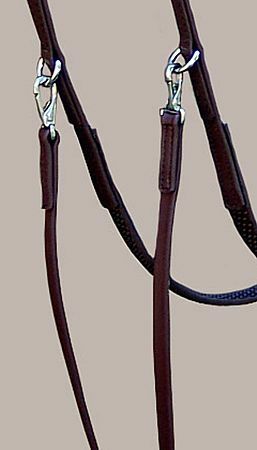 German Martingale in chestnut brown beta with brown rein grip in hand area pictured in ss hardware. 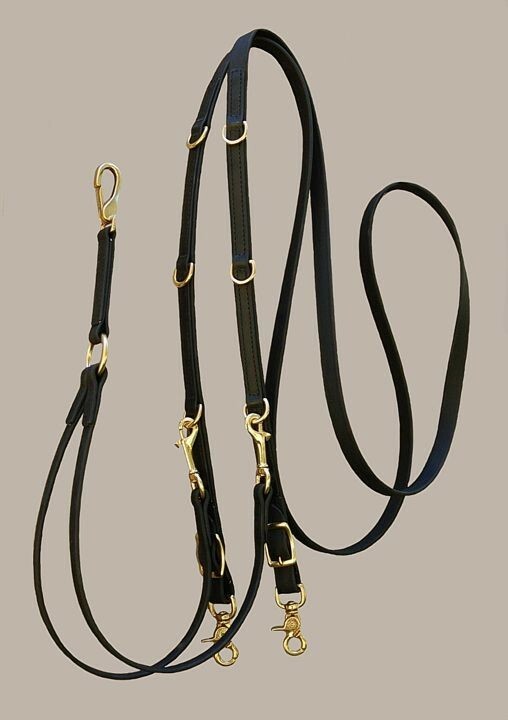 The German Martingale may be ordered on line below with PayPal or a credit card in black or chestnut beta. Choose your choice of hardware, length and color. Choose your choice of hardware, length and choice of beta color over black beta. 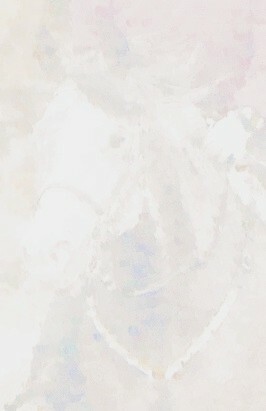 Germain Martingale, closed reins with rein grip in center. Choose your choice of hardware, length, beta color and grip color.